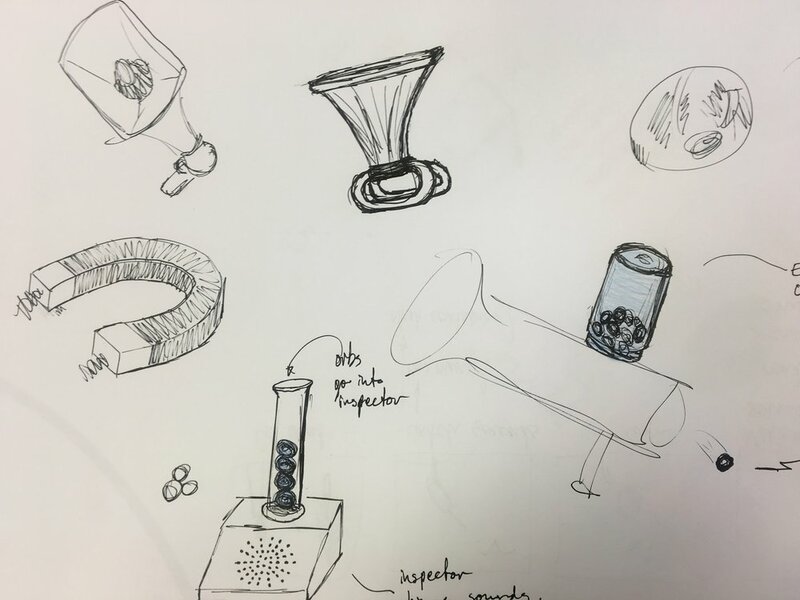 In this two week collaboration project between interaction design and advanced product design students, sound design concepts with product and interaction are demonstrated. 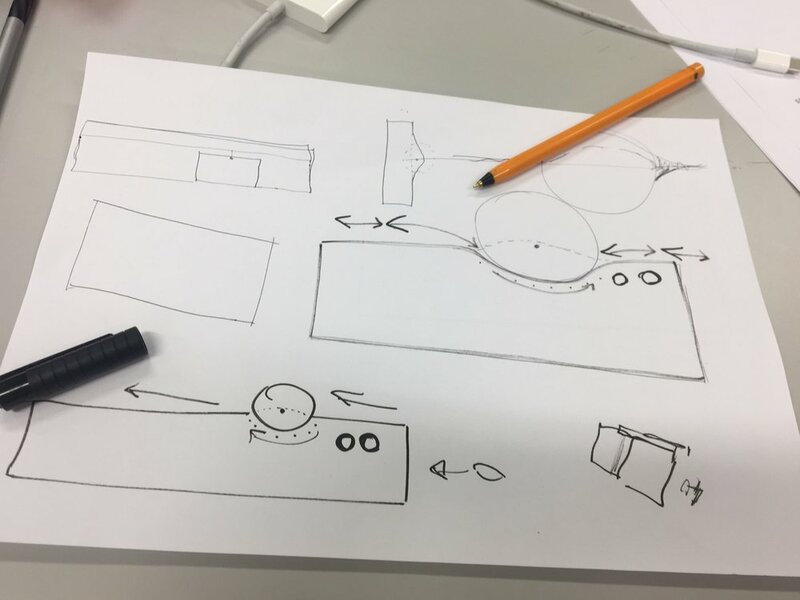 Although I have little experience in product design, I was excited to do basic sketches, models and try different forms for the product along with my product design colleague. I also worked alongside my colleagues to detail and design the most important and basic interactions that would make the sound design product tangible and expressive. I was involved in conceptualising the sound product during the entire process and put in a helping hand to shoot and edit the sounds and videos. 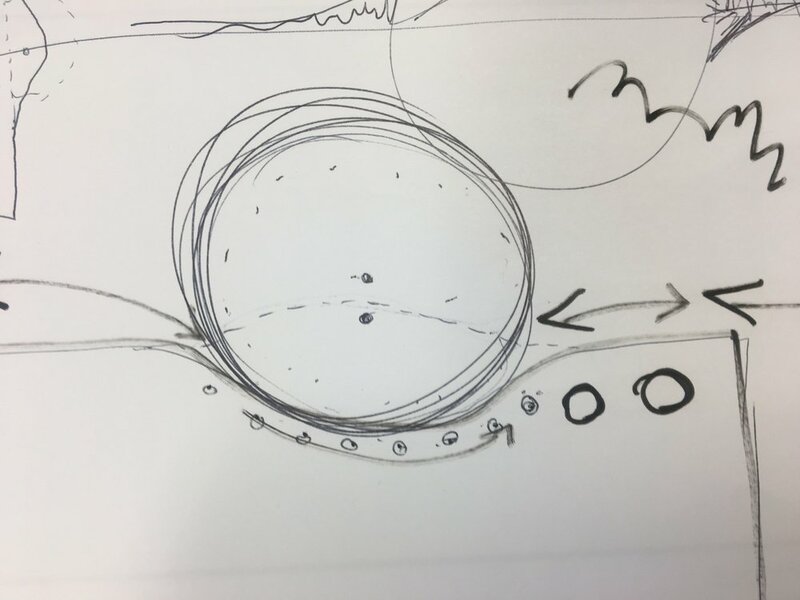 The team deliberately decided to do a Speculative design project. Main goal was not to design a product with sound, but to design a sound product. The team selected three elements that facilitate meaningful memory recording of soundscapes. Transforming sound memories into a physical form allows for a tangible experience of memory-recording and -making. Going back to the old analogue workflow of cutting and editing film material makes the sound capturing and creating experience feel like a ritual. The analogue process further allows a higher degree of collaboration with people, but also with the sound memory itself. The punch card and punched tape are mediums that can be used to contain digital information represented by punched holes in paper. We imagined to store captured sounds from the user's environment in such formats. Where then could the captured sounds on the punched tapes come from? Old analogue photography cameras and classic video cameras were the next inspirations we looked at. 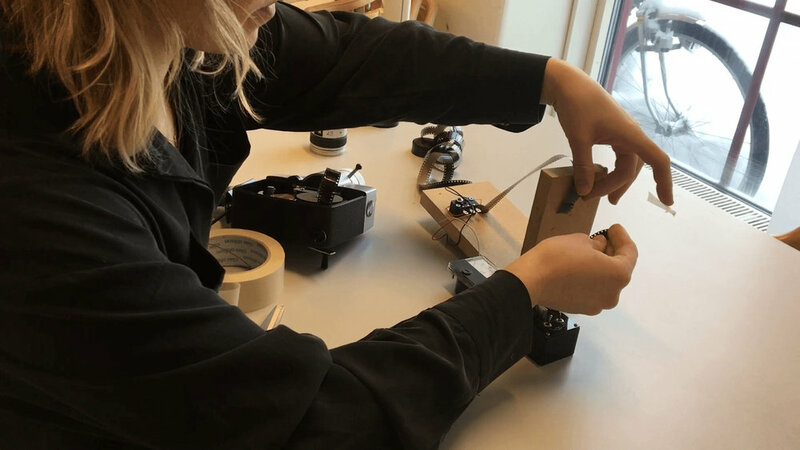 In order to make sense of how to go on with the collected inspirational findings (which includes the punched tape, video camera, and film editing equipment), we explored those by integrating them into role-plays. Colleagues observed the interactions of the yet undefined user with those objects. The outcome of the role-plays were used as a ground for the initial storyboards. We specified a character, with specific behaviours, appearance, expectations, and decision-making. The storyboards helped us to better understand how people, or better, Soundgrapher would use our product as well as how the user would flow through the interaction over time. The storyboard made clear, that the focus of the user experience was not so much about capturing sounds with a device. We refocused on the editing experience of sound punched tapes . We looked back at historical approaches on how people artistically worked with sound material. We also explored ways to make the punched tape tangible and interactive, so that people could skill up their senses and bodies, so that they could increase the ability to experience, express emotions and recognise emotions. Based on these thoughts, the term Soundgrapher was born. Making the intangible materiality of sound physical, opens up for giving sounds a form. We looked into analogue editing techniques of film and photography, that would allow for a form-practice with sound filled punched tapes. 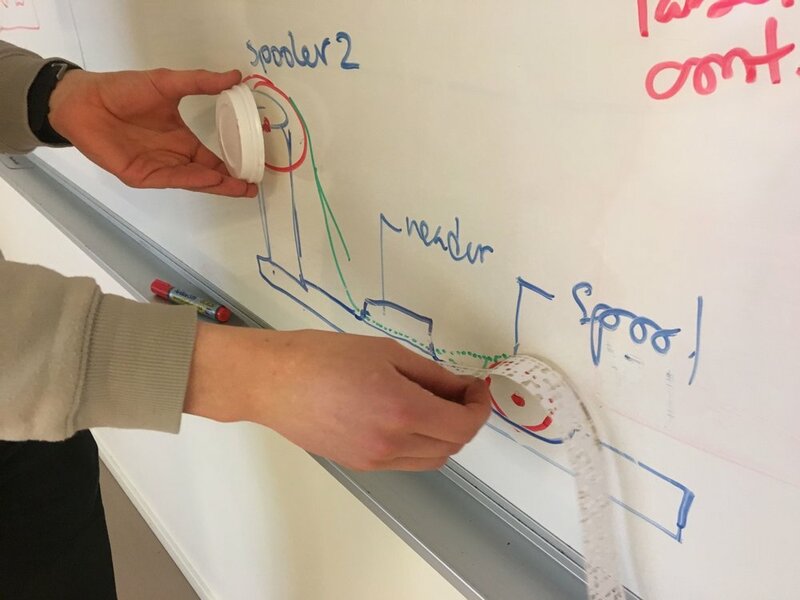 We sketched ideas about how the content of the punched tapes can become malleable while editing it with your hands. Interesting sound compositions could be developed through such sound form-giving practice. A form-giving practice in interaction design gives the ability of leveling form and function by developing the two through careful negotiation. The form-giving practice for the sound punched tape happens on a compatible reading device called Audio Memory Reader. When building prototypes for that reader device, we were confronted with questions like, to what degree does the punched tape get distorted when read by the Audio Memory Reader? What would be the difference then between the Reader and a Synthesizer? How do you feed in and feed out the tape? How much tolerance should the reading device be towards imperfectly edited punched tapes? The main interaction revolves around the wheel, that allows for scrubbing. The faster and stronger you press and roll the wheel, the more wild the rhythm gets on the sound punched tape. The small knob on the right lets the user adjust the volume. We explored different ways of capturing sounds with tools and products, for example by the paintball gun, the megaphone, or the magnet. 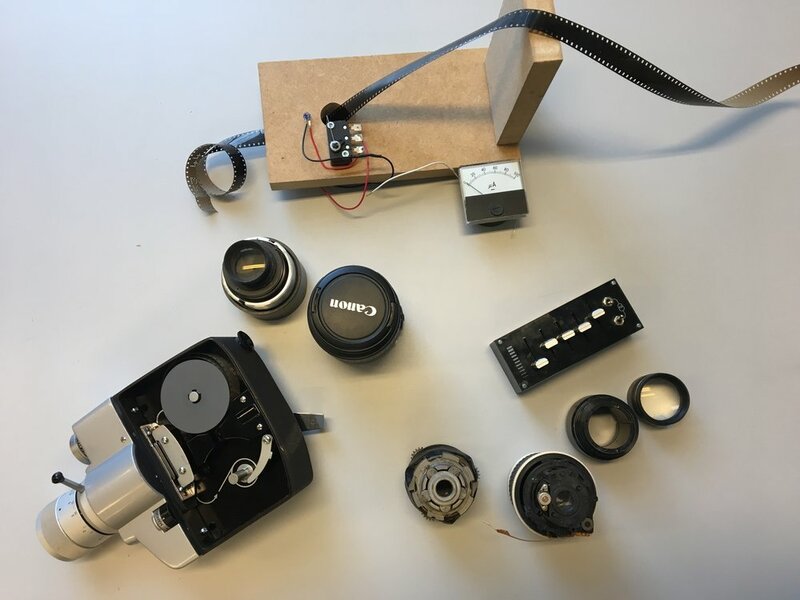 To make the Sound Capturer fit conceptually with the other products – the punched tape and the Audio Memory Reader, we decided to orient the Sound Capturer design on old film cameras. Sound boards were developed for the concept video, the Audio Memory Reader, and the Sound Capturer. For example, the sounds for the Sound Capturer were synthesised from analogue devices, which then were used to define the operational, functional, and feedback sound for the Capturer. We tested hypotheses for potential user scenarios through video prototyping. Aside the physical representations we made, we created a video narrative which communicates how our product line would be used in a real-world context.